Whether you are creating a cozy, private space or simply defining property boundaries, using a Westech brand semi-privacy fence installed by Strictly Fences is clearly the right choice. 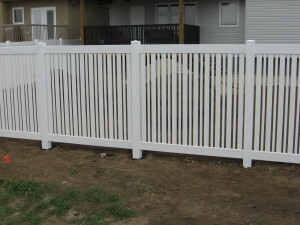 Westech Vinyl Fence is a mature and proven fence system that is the modern alternative to wood. It combines the style and aesthetics of wood with the technology and durability of PVC (Poly Vinyl Chloride is similarly used in most residential window frames and siding). Westech brand fence products carry a lifetime warranty, against defects in materials and workmanship such as, but not limited to; chalking, fading, cracking and discoloration. What’s more, Westech brand fencing by Strictly Fences allows you to be creative. Install a vertical board fence with three rails…or, work with us to create a more contemporary look. Just use your imagination. Semi Privacy doesn’t need to look boring, your imagination is your only limitation. We can bring your idea of the perfect fence into reality. Low maintenance, durability, beauty, and unlimited customization possibilities make a Westech brand fence system by Strictly Fences the perfect fence solution. You simply won’t find better, more attractive fencing products in the market today. 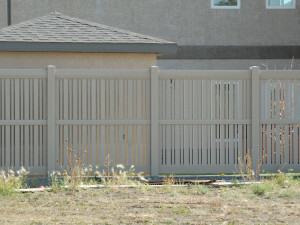 Semi Privacy fences are available in four colors however stocked in either Clay or White. Other colors (Almond and Stone) are available upon request. Please contact a Strictly Fences Team Member today at 1-866-799-4303 to get a Westech brand privacy fence installed at your house.